I had a look back at some of the things I've written since I started this blog here on the Stamp Magazine website, and I noticed with a slight feeling of alarm that most of it is thematic! And I'm not even a thematic collector. Well, not really, anyway. It's probably because it makes for easier writing?! But would you like to know what really makes my heart go faster? Well, I'm gonna tell you anyway. It's definitives! Plain, good old, traditional collecting of definitive sets, varieties, yes, even of the fly-speck kind, blocks, pairs, strips; you name it, I love it. So I'm going to chuck some of those in as well, every now and then, because I'm sure I'm not the only one to like this sort of thing. Or am I? This week I've been playing catch-up with my Scottish definitives. I hadn't updated them for a while so I thought I'd better get some items in before they get replaced with newer stuff. And so I went on the phone to Royal Mail and got myself some cylinder blocks. I know I have often stated that I only collect modern stamps if available at the post offices, but my local post office has the horrible habit of tearing off all sheet margins before the stamps are sold. So no way would I be able to get my cylinder blocks over the counter. 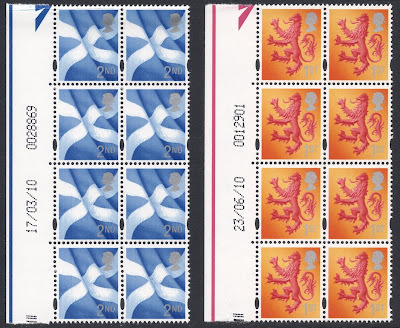 And seeing that I do want my Scottish definitives collection to be as complete as possible, I make an exception for those. The good thing was that, even though the stocklist mentioned that certain values had already been withdrawn, I was still able to get cylinder blocks! You may imagine I was very pleased with Royal Mail's service! 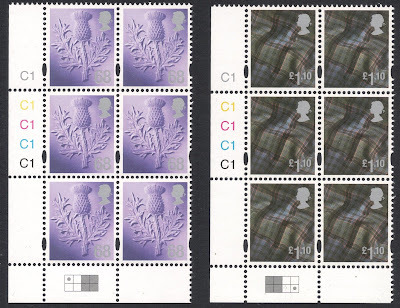 These particular blocks are the first Scottish ones to show the new cylinder grid, replacing the traditional dot and no dot style. As you can see, both values were from the left hand side of the cylinder. The greyed out bit means that the value was not printed in that position, so basically there's only one position to collect. So I managed to complete these two values in one go! I was less fortunate with the next two values. 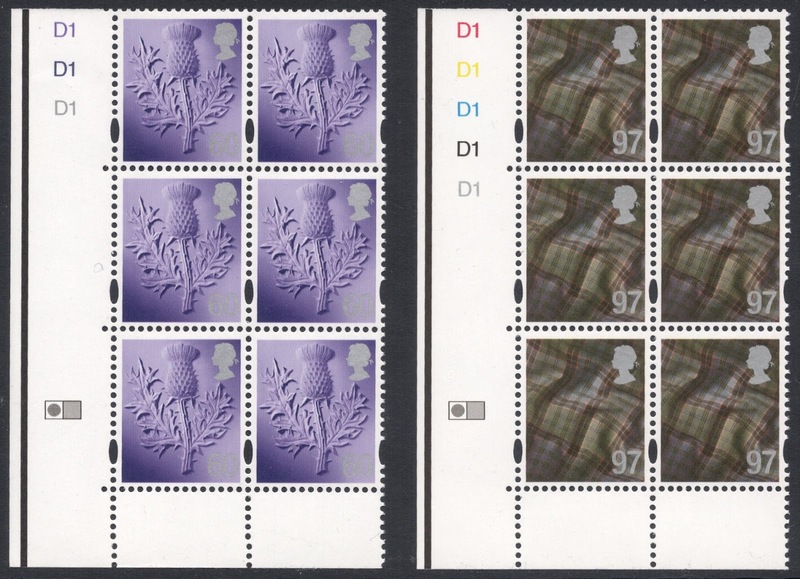 The 68p and the £1.10 were no longer printed by De La Rue but by Cartor, and no longer in gravure but in lithography. And they were printed in smaller sheets, of which there were four on a cylinder. So that means that if I want to be complete I will need to get four blocks of each value. Seeing that they've just been replaced this week with the new values, I don't think I'll get those together soon, but at least I've got one pair, so that's a start! By the way, have you noticed that the lithographed 68p (that's the thistle one, the value doesn't really show on a scan, or on the actual stamp either!) is no longer printed from dedicated colours but just the same CMYK colours as the £1.10?! 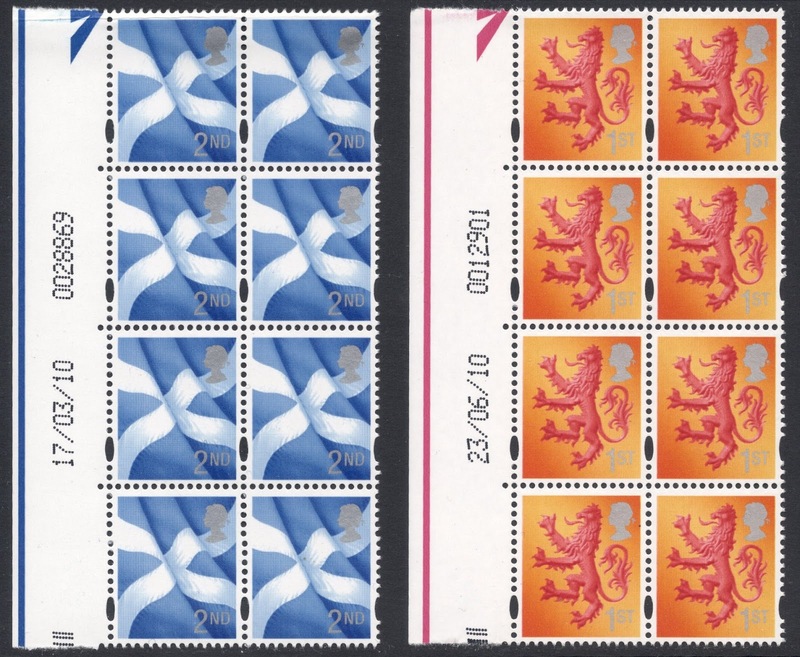 Oh, and by the way, if anybody knows where I can find a list of all printing dates for the Scottish stamps, I'll be forever grateful. The most recent list I could find went up to 2006! And then I've heard a rumour that the 1st and 2nd class stamps will soon be printed as self-adhesives, so there's more to look out for soon. I'm not too fond of self-adhesives but at least they normally have perforated sheet margins so hopefully my local post office mistresses won't feel the urge to start removing these as they don't hamper staff as much as the old-fashioned margins apparently did! Whoops, am I rambling on a bit? Sorry! But you see, once I get going on these, there's just no stopping me! A man after my own heart, I have an earlier collection (all counties)from day one, but mine are in blocks of 8 showing the country of origin. Like my Machins, this collection of definitives are also my pride and joy. I get a great deal (hours)of pleasure just browsing through the stock book where they are housed. I see my colleague in Machin Madness got here first! I, too, love definitives. Along with my albums full of Machins, I have small collections of definitives from Canada, Australia, and several European countries. I am, of course, attracted to long series with identical or similar designs. Thank you gents for that ringing endorsement! Makes me feel soooo good! And Larry, you really should have gone for it. It's such a great set to specialise on and you'll forever kick yourself for not having bought it! Although Royal Mail have told us this, there won't be a FD process as the stamps are not new as far as they are concerned.